I was a witness. A witness to nature's magic. I felt like a tree. Awake yet still. I felt like the sky watching the earth. I felt. But I did not move. Like the passive earth that witnesses the twinkle of each star. Or the uncurling of each blade of grass at the safe prodding of light. I was a witness. And so was my family. Along with so many others who had gathered on that beach. Before the dawn of New Year's Day. Some were sitting along a rock boundary, some lying on the sand in front and many standing behind us. I looked at Ma and Pa who sat fingers interlocked, in the midst of the crowd of humanity milling all around us. They were staring ahead at the dark sea, alone in their togetherness. This was Cape of Comorin - the Cape Reinga of India – almost at the southernmost tip of the peninsula. We were in a town called Kanyakumari in the Indian State of Tamil Nadu. Contrary to the popular (and sensational) belief that Kanyakumari lies at the meeting point of three bodies of water, the Bay of Bengal, the Arabian Sea and the Indian Ocean, it is surrounded by only one: the Laccadive Sea. But I didn't know this. I had come to see the confluence of the three waters. Neither did I know that Kumari Amman or the Kanyakumari Temple, located on the shore and a famous pilgrimage for Hindu girls, is dedicated to a manifestation of Parvati, the virgin goddess who did penance to obtain Lord Shiva's hand in marriage. But I did know that Kanya meant girl and Kumari meant virgin in Sanskrit. On a rocky islet just off the shore, southeast of the Kumari Amman temple, was the Vivekananda Rock Memorial, built in 1970 by Eknath Ranade. 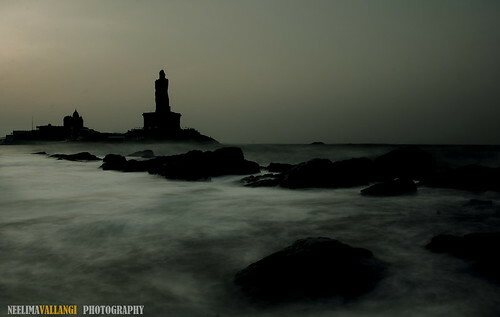 On another islet just behind the Memorial rock was the 133 feet (41 m) tall statue of Tamil poet Thiruvalluvar, one of the biggest statues in Asia, completed in 2000 by sculptor V. Ganapati Sthapati. A rock boundary circled the border of the mainland, where we sat. It rested on top of a small bluff, five metres from the low tide mark. The ash grey rocks were neither sharp nor smooth. I sat on the boundary comfortably, and allowed my legs to dangle freely in front of me as I gazed out towards the horizon. It was dark, but not pitch black. Josh was looking at me, watching me. I smiled at him and looked out again. I could make out some boats on the water. A few people sat in each boat. All were waiting. Waiting for the ball of fire to rise from deep inside the sea. From the water's womb. Just an ordinary event, some would say – Sunrise. But how many times do we stop? To watch it? And reflect? Beauty unfolds in a sunrise. Or a sunset. But we have no time, so we remain oblivious. Of the happiness in small joys. Of the extraordinaire in the ordinary. Of the uniqueness in events common and regular in life. We do not discover, because we do not seek. And so, even when the magic is unfolding all around us, we do not witness it. The sea was calm. Waves crawled in towards the beach. Then crept back out to the horizon. They were like a hand reaching out towards me. A mother's hand - reaching out to caress me lovingly. Forwards. Then still. Backwards. Then still. I felt their touch. The heartbeat of the sea was in sync with mine. A light breeze rose from the shadows of the sea. It came in with the waves and left with the waves. Its fleeting coolness tickled me between my naked toes. Then spread through me like dye in a cloth. It was soothing. Relieving. A reassurance that life renews itself in every moment. Each breath I took in its wake, filled my lungs with its live energy. It travelled deep inside me, rejuvenating my acquaintance with parts of my body that had long since been forgotten. Then it left me slowly, only to return and refresh me again without being asked. And again, And yet again. What had I done to deserve such abundance? What promise had I given? What purpose would I serve? For nature, to want to bless me so opulently with life and health? Would I be willing to repay its generosity when the time came? I wanted to. Would I be a good investment for nature? I wanted to be. I felt blessed and grateful. With each heartbeat, I sensed a warmth rise up in me. In sync with the world inside my head, light in the world outside crept higher. Slowly, steadily. Rising from a deep dark abyss beyond the horizon. Black sky merged with the sea, its darkness dissolving in the saline waters. Turning from black to pink, then to purple, and then to blue. Dark evaporated. There was light. What is darkness, I pondered? Truly, just an absence of light. Gone in a flash, like it had never ever existed. The horizon lit up. It was an unforgettable sight. A giant majestic halo rising towards the sky, reaching for the stars that beckoned from above. The sun peaked shyly out of its watery blanket. Water reflected its light, magnifying its size. It climbed slowly, like it knew no care in the world, nor had chores to worry about. It was an amazing extravaganza. A great spectacle. The orb grew more confident as it rose. Glowing promisingly with every lazy step out of the sea. I closed my eyes and felt it reaching out to me. Touching me, encapsulating me. In its mellow radiant warmth. I felt safe, secure. Time stopped. To witness this camaraderie. To live this moment. Like me, it was a witness. To the nature's magic.